I prepped a bunch of smaller panels for painting over the weekend and thought I would share some tips I learned after a lot of panels sliding around, cursing and gesso being splattered all over my clothes and room! There are probably a ton of ways to do this but this way worked really well for me for the smaller panels. I grabbed a piece of foam core that I use for packaging but any piece of stiff cardboard will do. 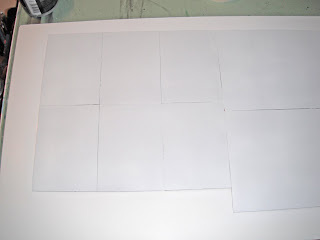 Take each panel and apply a circle of masking tape to the back of the panel & press down on the foam core with the other side of the tape circle. I used two tape circles for each panel just to be safe & then stuck them all on quite closely together so that paint would not drip too much between each panel. Then I used a roller over the entire surface rather than painting each panel separately, so much faster & cleaner! 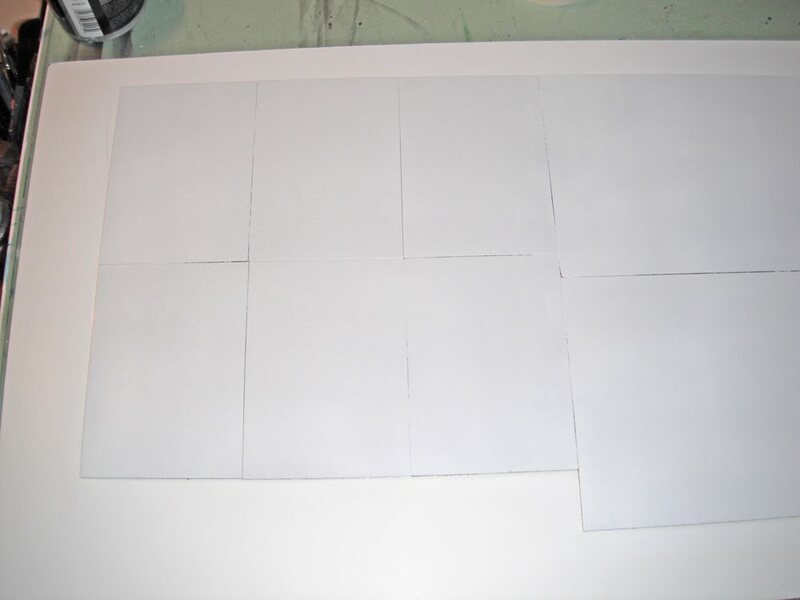 This is a photo of my panels attached to the board, six 5x7" panels and two 8x10" panels. I lightly sanded with 100 grit sandpaper and then wiped with a damp lint free cloth. Then I brushed on a layer of GAC 100 to seal the surface. Once dry I used a small foam roller to paint on the gesso (or oil ground depending on what I am using the panels for - oil or acrylic). I found with the roller that I got such a smooth surface I did not even need to sand between layers but I am guessing as the roller wears out I will need to again so I will use the 100 grit sandpaper and wipe off the dust between layers. I let each layer dry before adding the next layer of gesso, applying in alternating directions (ie first horizontal, then vertical etc). I probably did not need to but just to be safe after the final coat of gesso dried I used a razor to separate the panels. This time around was so much less painful using this method, but honestly, the only part I enjoy about prepping panels is being finished! Wow, that sounds like a lot of work. I know I always think that when I am reading someone else's description of panel preparation. It actually is getting less painful and does not take too long once you get a system going. Just do other stuff during drying time. Now making my own ground - I doubt that will happen ever!